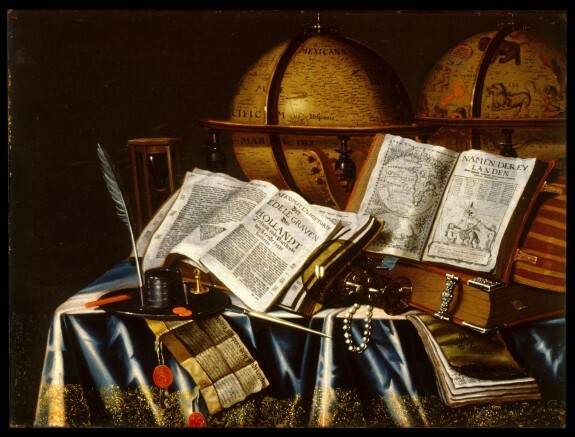 Description The Dutch "vanitas" (Latin for vanity) still life brings together the prevailing moral tone and an appreciation of everyday objects: how vain and insignificant are human concerns, and, therefore, how important it is to turn to God. The term comes from the biblical Book of Ecclesiastes (1:2) "Vanity of vanities! All is vanity." These objects symbolize transitory human achievement and satisfactions. The atlas is open to a map of the East Indies, source of many Dutch fortunes, and there is a city council document with an imposing seal. The other open book is a history of the early counts of Holland-whose lands were absorbed by the dukes of Burgundy in the 1400s. The lute, music, and inkstand represent creative endeavors, which, like satisfaction in beautiful objects such as pearls, are transitory pleasures. Even the heavens and the earth, represented by two globes, are effected by Time, whose relentless passage is marked by the hourglass. The little-known painter Adam Bernaert, who monogrammed this painting, often took his inspiration from paintings by the better-known Evert Collier. The present composition is closely based on a Collier composition signed and dated 1663, which in February 2008 was with the Dutch dealer Salomon Lilian. New Light on Old Pictures: Dutch and Flemish Paintings from the Walters. The Walters Art Gallery, Baltimore. 1981-1982. Going for Baroque. The Walters Art Gallery, Baltimore. 1995-1996. Provenance Don Marcello Massarenti Collection, Rome [date and mode of acquisition unknown]; Henry Walters, Baltimore, 1902, by purchase; Walters Art Museum, 1931, by bequest.